CSA shares are packed for another Monday of on-farm pick-up! It’s one of those great hits of momentary satisfaction to see them all, 100% absolutely and finally done, waiting to be collected. Mel, Jordan (above), Michelle, and Tara were all in the field, and the whole harvest went by kinda quickly, maybe three hours. I’m also figuring out the easiest ways to use different spots around the new farm. Today, as a temporary improvement, we moved the long screen table into a tree-shaded part of the drive, allowing us to line up the bags in one row, instead of grouping them on two smaller tables indoors in a shed (it’s all in the details! :). Keeping the packing space uncluttered is kinda critical if you don’t want to spend half your time rechecking shares to make sure that they’ve got everything. When the set-up works, filling shares is really suprisingly satisfying. On the tiny farm, assembly lines can be fun! In the share: baby leaf lettuce salad mix, baby zucchini, cauliflower, garlic scapes, young carrots, beets, new potatoes, curly& flat-leaf parsley. 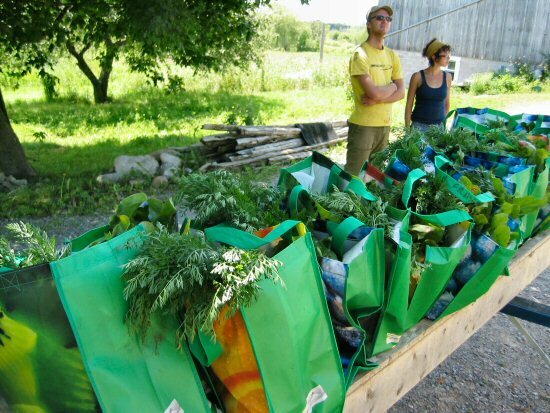 you know, you could have your members load up their own bags, seeing as you have on-farm pick-up–could save you a couple of hours and from my experience, they love choosing their own veggies! How is our tomato crop this year? I am following your “smallest transplant” experiements and was curious. janet: Yes, buffet-style works well! We tried it for the first time last year at the farmers’ market. Some things were prebundled or bagged, the rest loose, and as shareholders showed up, we told them how much to take. This year, the pick-up situation is reversed from last, most of the pick-ups are on the farm, so I’ll probably put up a sign explaining what to take. So far, though, we haven’t finished a big pick-up space in the barn (new flooring, ramp), and there’s not much room in the shed we’re using. Svetla: Everything is extremely slow, not much sun. It’s raining today for the first time in over a week (good), but it was only half sunny for that week, and cloudy and wet is forecast for the next 5-6 days at least. So looks like things are gonna continue to be slow. But, all things considered, the toms are growing OK. Fruit is setting on the first ones in. Joe: We cut some scapes for the shares above (I’ll add the veggie list to the post). They taste as they should, just maybe a third smaller. So the garlic is about 3-4 weeks behind fall-planted in scape time. Some are sizing up OK so far. Stay tuned! eric: Oh, no, not Twitter! :) It’s a time-drain, and I get too caught up with reading (and retweeting) all sorts of food activist type stuff, when I should be concentrating on the blog here, which is really part of the tiny farming, which is what I’m supposed to be doing ALL THE TIME! :) In any case, the latest Twitter updates and a link are at the bottom of the middle column on the right, for now. Awesome. I’m living vicariously through you. The bags of veggies look great! I just found your blog via google and i love it!! I can relate to the “little details”…they truly make all the difference. we are a fairly new farm over here in shelter island, NY and we are constantly brainstorming new ideas and trying to make things beneficial for both us (the farmers) and our customers (its our first year–25 families in the CSA!) we are fairly small as well, currently only farming 1 acre. Looks great–I look forward to reading again! I’m so worried about the way our children are headed in nowadays. Watching Jamie Olivers food revolution tv show scared the thingies out of me. I suggest we all start cooking some healthy recipe like these at home if we’re going to fix this horrible situation. The ones on that site seem pretty easy, I tried last night and it’s the first time my family has eaten healthy in so long, I just feel wonderful. Great work! Nothing like fresh from your own garden produce! Do you raise another livestock aside from the chicken? I use a company called nutrafarms Inc. for all of my meat. They supply free range, hormone free product. My family loves it!